Its not the orangutans or the colorful diversity of birds, neither is it the primates nor the hornbills. 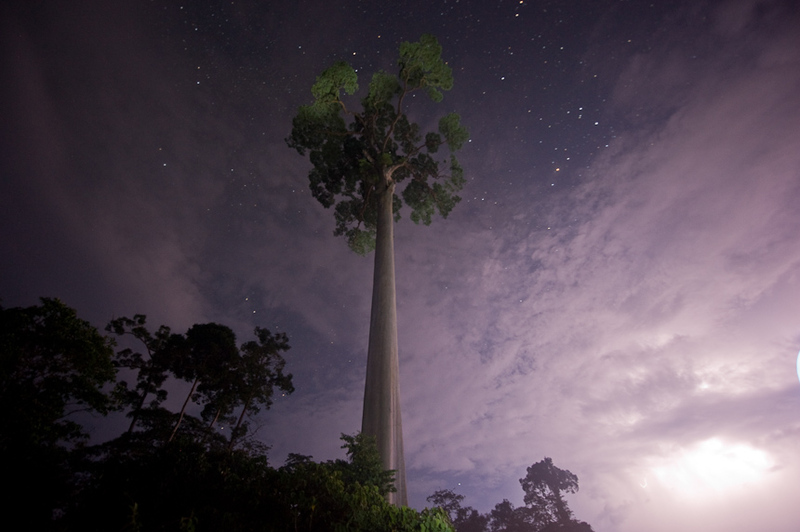 Its the giant trees that take your breath away in Borneo. You feel as if all the trees that you have seen in your life were Lilliputians and now you have come and bumped into Gulliver himself. These trees are spectacular. One has to work really hard to see the whole tree. From the ground, the top of the tree either disappears into the canopy or into the mist, either way, the only part of the tree that you will ever get the see is the main trunk. Divya Mudappa admiring the base of a massive Ficus tree growing on a dipterocarpThey look very still, but in the rainforest, they are working every second – for water, nutrients, light, and space, and to fend off a host of parasites and predators of all kinds. 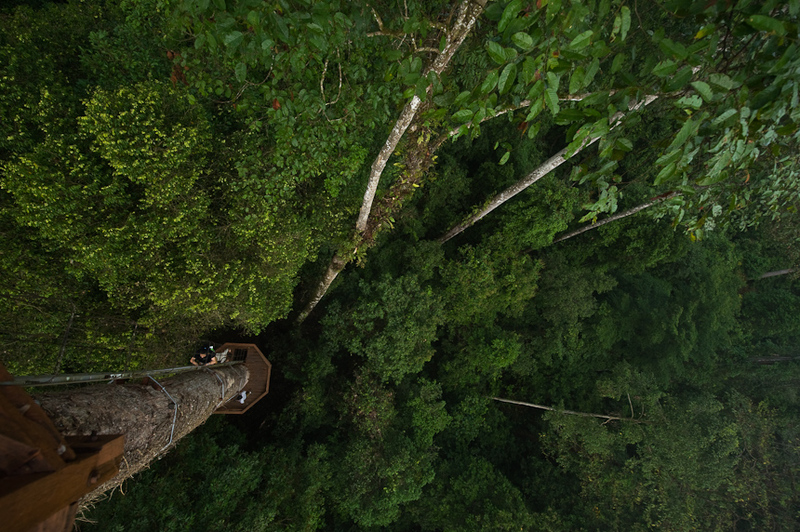 But one amazing thing about Borneo is that, one can climb up and stare at these forests from the top — see the top canopy at eye-level, and still have canopy emergents towering above you. Climbing itself is quite an amazingly exhilarating experience and once again, you really realise and appreciate how tall these trees really are. 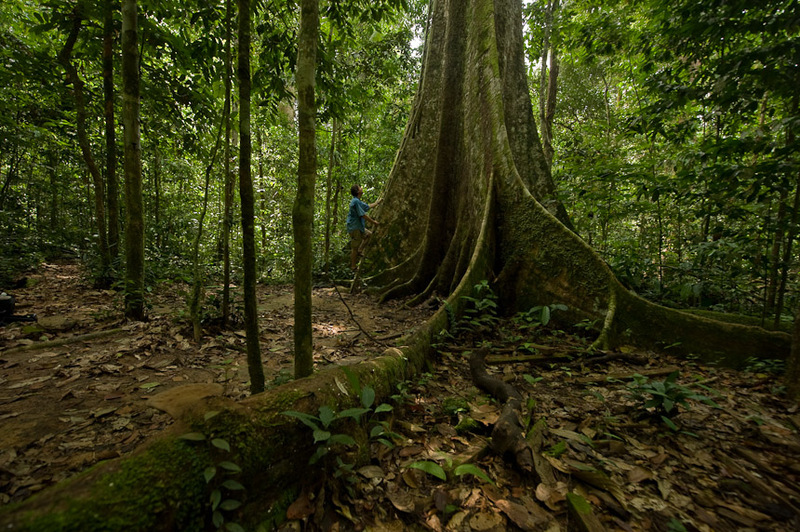 Many biologists say that the true life in the rainforests is up in the canopy. From up there, you get a feel of the world view that the primates and hornbills enjoy. View from the canopy platformI’ve always found that in nature, trees are the most difficult subjects to photograph. Its very difficult to do justice to the grandeur of some of them. One of the most spectacular trees in the world is the Koompassia excelsa (also locally known as Mengaris) and on my recent Borneo trip, I had decided to photograph this tree. 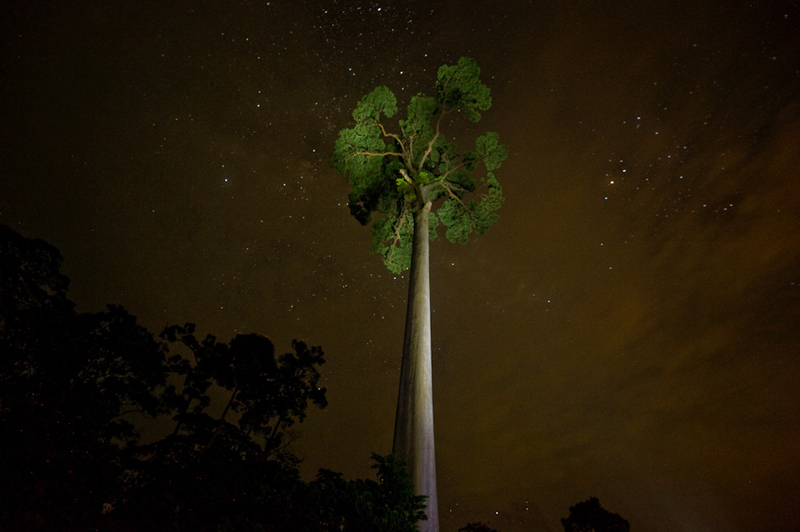 Koompassia excelsa is one of the tallest tropical tree species. In an undisturbed forest, its very difficult to see the whole tree. Most often you just see the trunks, while rest of the tree merges with the others in the canopy. Base of a Koompassia treeBut if you find one in an open or logged forests, you really can feel the size and scale of the whole tree. 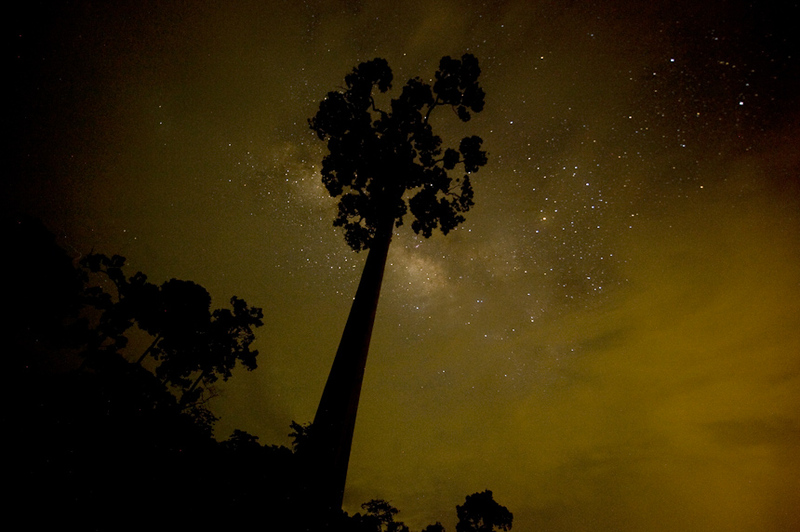 We found this particular one in Tabin Nature Reserve, right by a road and on a night safari. It was amazing to see this tree against the sky full of stars. So to photograph it, I setup my camera on the bag and took a long exposure shot of this tree. I thought something was missing and thought, it might be a good idea to light up part of the tree. So I decided to Light paint the tree. Divya and I panned the trunk and the canopy with a LED torch light while the camera was on its 30 sec exposure. Light painting of a Mengaris treeThe clouds were building up and in one of the subsequent tries, a lightning lit up the horizon and created a very dramatic effect. Every time I look at the photo of this tree, it transports me to Borneo. Not just some of the best images you’ve taken but some of THEE most awe-inspiring images I have ever seen. Absolutely gorgious photos. Light Painting is a wnderful caption given. 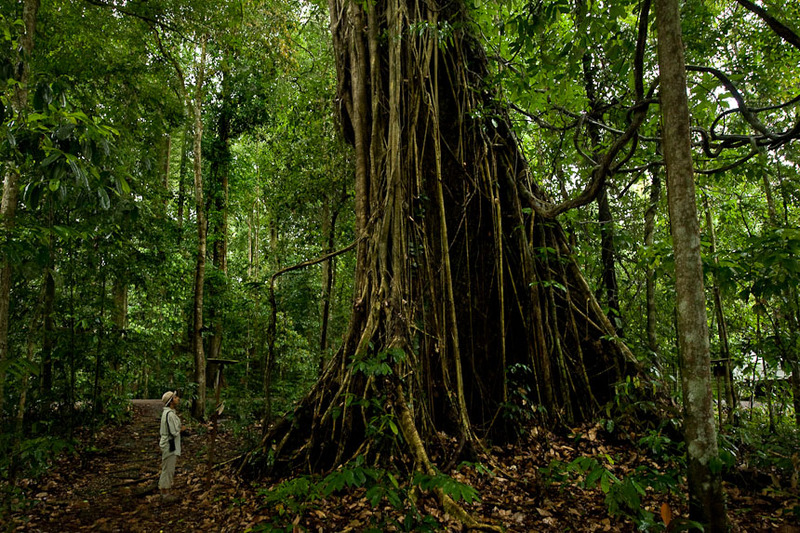 As i have seen trees of Andaman islands are also massive but Koompassia tree is very tall. Tthanks for sharing the snaps. Everything has a beauty inherent in itself. May it be wild animals , domestic animals, street animals or the small surbs and giant trees. It takes time to observe it carefully so as to find the inherent beauty. And it depends on the matter of fact of your analysis. I would just appreciate the awesome clicks and ideas involved in clicking. Oh WOW!!! amazing pics, its beautiful and magical. I would say, I’m now a fan. Great work Kalyan. Majestic piece of work.Nice tonal quality.light painting is indeed an interesting effect, star trails could have been another interesting effect here. Absolutely lovely images….. you can now add another fan to your list! Thanks for sharing them and the little techniques you used. Its so amazing that I cant take my eyes from these wonderful pics…….. \Koompassia tree light painting with lightning lighting up the sky\ my favorite…..
Amazing pictures kalyan….I cant take my eyes from these wonderful pictures…… Wonderful treat for the eyes…..